Bastian Balthazar Bux is unpopular, has no friends and his father is distant. 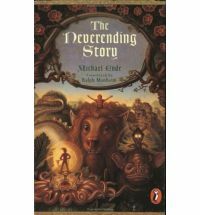 Then one day he does the unthinkable, he steals a book – ‘The Neverending Story’. As he settles in to read it his story slowly entwines with that of The Childlike Empress and her chosen hero, Atreyu. Fantastica is dying and needs a different kind of hero though, can Bastian help without losing all he is. Michael Ende created a thoroughly detailed and varied world. Not only is this a fantasy adventure but it is also a journey of self-discovery. Wonderful creatures, some familiar, others not so. Some are good, some bad and some characters you will never forget: brave and loyal Atreyu, Falkor the Luckdragon, Xayide the witch and Grograman the Many Colored Death. As a child this book swept me up into it’s wonderful pages and I read and re-read it. I cried in parts and surely laughed. I loved this book and still do, it’s been read so often it is falling apart.